We are proud to have three incredible riders on staff as the owner, resident trainer, and barn manager. Read more about our Poolesville staff here! As a veterinarian, life-long rider, and accomplished FEI competitor, Lucy was thrilled to find this property in 2015. Growing up on a horse farm in upstate New York, she has wanted to find an equestrian property of her own in this area for many years. Locks Edge's 57 breath-taking acres combined with a perfect location was exactly what she had been looking for to meet her goals. An extensive renovation of the existing barn and the addition of an indoor arena and new outdoor arena took many months to complete but have more than exceeded her goals. She lives on the property to help keep a close eye on the horses and to take full advantage of the incredible facility. Resident trainer Siobhan Byrne is a USDF Gold, Silver and Bronze medalist. She is a sensitive and sympathetic rider who aims to bring out the best in every horse through the principles of classical riding. 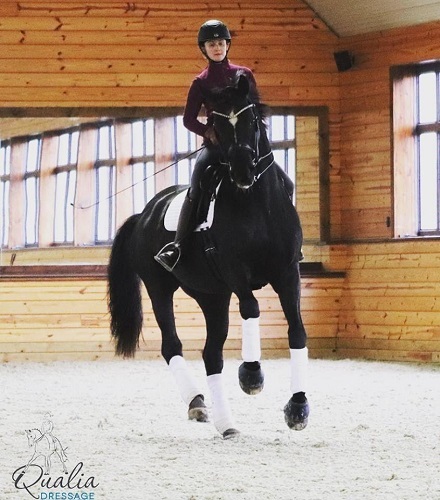 Siobhan is also an excellent teacher, and has coached students to USDF medals as well as wins and placings at GAIG and BLM Finals. More information about Siobhan can be found at www.qualiadressage.com.